Akka HTTP offers a general toolkit for providing and consuming HTTP-based services. 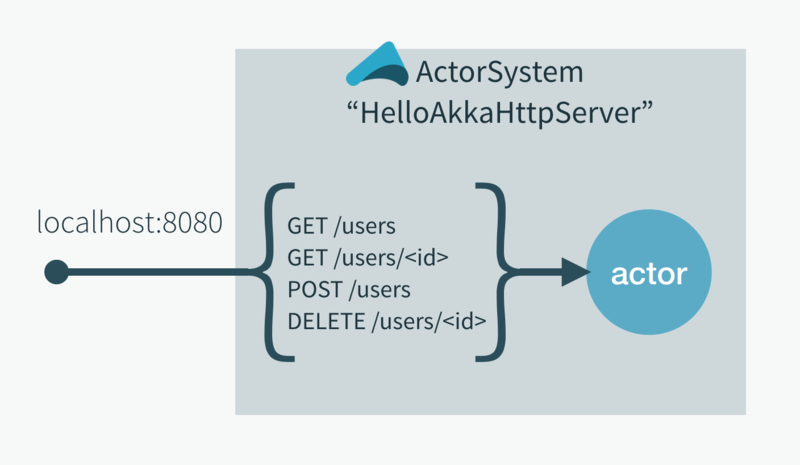 The Akka HTTP modules implement a full server- and client-side HTTP stack on top of akka-actor and akka-stream. A typical application does not sit on top of Akka HTTP. Instead, Akka HTTP makes it easier to build integration layers based on HTTP, and therefore stays on the sidelines. This allows you to base your app on what makes sense and use Akka HTTP for HTTP integration. Akka HTTP is not a framework–not because we don’t like frameworks–but to provide maximum flexibility. For example, you might use the Play framework to implement browser-based interactions or Lagom framework for creating microservices, both of them are also based on Akka. Akka HTTP follows a rather open design and often offers several APIs for accomplishing the same thing. You can choose the API with the level of abstraction that best suits your application. If you have trouble achieving something using a high-level API, you can probably find a lower-level API to use. The low-level APIs offer more flexibility, but might require you to write more application code. Download the quickstart project and run the app. Follow this guide to explore the code. Integrate the project into IntelliJ. If you prefer a different IDE, the principles should be similar, as long as it supports Scala. Having a basic understanding of Akka actors will make it easier to understand the example. If you are new to Akka, we recommend completing the Akka Quickstart guide before this tutorial. You can run the Akka HTTP example project on Linux, MacOS, or Windows. The only prerequisite is Java 8. Download the project as a compressed file from Lightbend Tech Hub by clicking CREATE A PROJECT FOR ME. On Windows, use a tool such as File Explorer to extract the project. In a console, change directories to the top level of the unzipped project. On Windows systems, enter sbt.bat. When you run sbt, it downloads project dependencies. The > prompt indicates that sbt is running in interactive mode. At the sbt prompt, enter reStart. sbt builds the project, starts an Akka HTTP server, and runs the example application. The Akka HTTP server is now running, and you can test it by sending simple HTTP requests. You can restart it by entering reStart again, and stop it with reStop. To restart your application each time a change is detected, run ~reStart. The user registry example contains functionality for adding, retrieving, or deleting a single user and for retrieving all users. Akka HTTP provides a domain-specific language (DSL) to simplify the definition of endpoints as a Route. In this example, a Route defines: the paths /users and /user, the available HTTP methods, and when applicable, parameters or payloads. To get started, try registering and retrieving a few users. You simply need to know the appropriate parameters for the requests. In our example app, each user has a name, an age, and a countryOfResidence. A command line tool, such as cURL. Browser add-ons such as RESTClient for Firefox or Postman for Chrome. The system should respond after each command to verify that the user was created. Set the Header to Content-Type: application/json. In the body, copy and paste the following lines to create three users (send each payload separately). Note: for Postman, you might need to specify that you want to send raw data. The system should respond with a list of users in JSON format. Congratulations, you just ran and exercised your first Akka HTTP app! You got a preview of how routes make it easy to communicate over HTTP. QuickstartServer.scala – contains the main class which sets-up and all actors, it runs the Akka HTTP routes. UserRoutes.scala – contains Akka HTTP routes that the Server will serve. UserRegistryActor.scala – implements the actor that handles registration. JsonSupport.scala – converts the JSON data from requests into Scala types and from Scala types into JSON responses. First, let’s dissect the backend logic.